The Drake Tower at 1512 Spruce St. 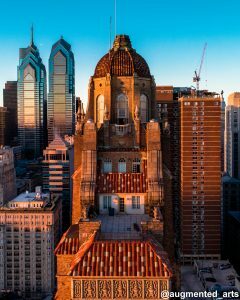 Built in 1929, the Drake stands as a magnificent addition to the Philadelphia skyline. It IS a condo building. Back in the 1970’s, they converted to condos with a less than enthusiastic welcome. Per public records, only five (5) units are privately held – the other 300 units are owned by one entity and are used as RENTALS. The penthouse units start on the 24th floor. Through most of the 1990’s- all penthouse units were vacant shells. Some penthouses housed gardens and the top penthouse had its own pool. The building is faced with small details of ships, mermaids, and other sea paraphernalia. My first apartment was in the Drake in the late 1980’s when Duran Duran was on MTV and telephones had cords.